Today, we are posting one of our “vintage” interviews. 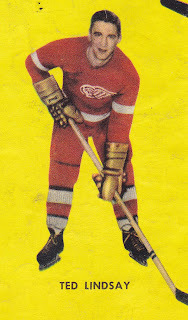 It is from the late summer of 1978 with then Detroit Red Wing General Manager Ted Lindsay. The focus of the interview had to do with Lindsay’s decision to sign a free agent- Rogatien Vachon—and how things turned out. I was a young guy in broadcasting at the time, and Lindsay was generous in giving his time- though he certainly had a message to deliver, as you will hear in the interview. The background is that, in the summer of 1978, the notion of “free agency” was just coming into prominence in the NHL. There was no complete free agency like there was in baseball. A player whose contract had expired could sign with a new team, but at the time, the team losing the player was required to provide “compensation”. That compensation could take the form of players and/or draft choices. Well, that summer, Lindsay, the former Red Wing great and Hall-of-Famer, was looking to help his team in goal. 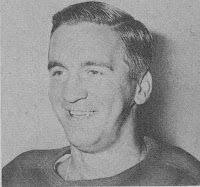 He signed Vachon, who had been with the LA Kings for several seasons. When Lindsay signed Vachon, everything hit the fan. He couldn’t work out a deal with LA Kings owner Jack Kent Cooke and the Kings. He initially thought the arbitrator, who had handled an earlier case involving the North Stars and their GM Lou Nanne, might issue a fair decision. Interestingly, McCourt’s career never quite came to prominence as Lindsay and many others expected. He was a gifted offensive talent, though not a gritty forward. Whereas, years later, Steve Yzerman was able to make the transition from a mostly offensive player to a strong all-around performer, McCourt never quite made that transition, it seemed. He put up big numbers through 1981-’82, but faded somewhat after being traded to the Sabres along with fellow first round draft choice (and future Leaf, Mike Foligno). McCourt played his final NHL season with the Leafs in 1983-’84, signing as a free agent (without compensation, that time) before playing several seasons in Europe. As for Lindsay, the decision to sign Vachon may well have been something he ended up regretting. Team chemistry was likely harmed and the move to bring in an aging goalie (Vachon) cost the Wings valuable draft choices in the years to come. The Wings made an initial surge under Lindsay in his time as GM, but it didn’t last. It wasn’t until former Islanders super scout Jimmy Devellano came on board as the Wings GM in 1982 that the Wings used the draft over time to build a squad that eventually become a contender and then a championship team in the mid-1990s. I’ll post on Lindsay (pictured left) and his playing days another time, but for now, enjoy the interview, from more than 30 years ago!